If 2016 was the year of single-item, no reservation restaurants; 2017 has been the year of the super hotel. First it was The Ned, Soho House’s landed cruise ship, taking over an old bank building in the city of London – featuring 252 bedrooms, nine restaurants and a rooftop bar, all of which have been filling our Instagram feeds since summer. Soon after, Robert Deniro and Nobu Matsuhisa brought one of their Nobu hotels to Shoreditch. Then The Mandrake Hotel opened in Fitzrovia and quickly became London’s most fashionable boutique hotel. The first hotel from Beirut-born Rami Fustok, The Mandrake has a cosy theatre for guests, 30 bedrooms and three suites – one of which includes a Bedouin tent-style bed. The Mandrake is also home to the first international offshoot of Serge et le Phoque. 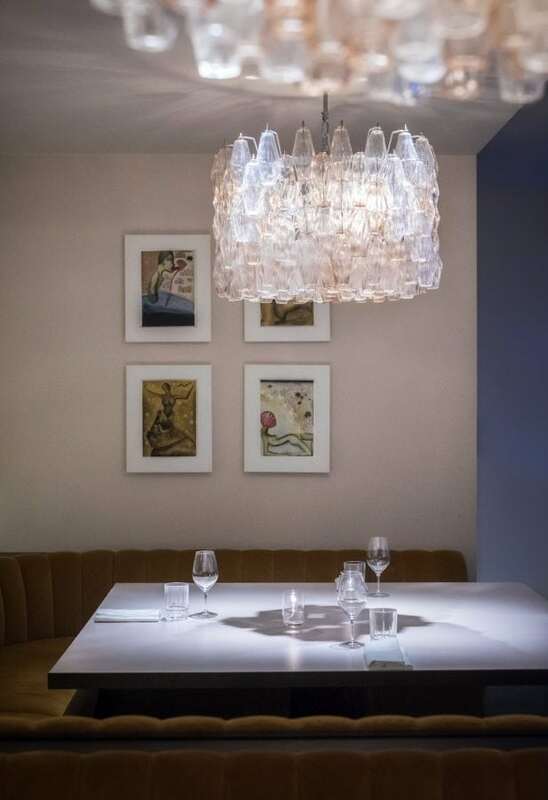 Following the success of the original Hong Kong restaurant, Serge et le Phoque is the first London restaurant from interior design specialist Charles Pelletier and restaurateur Frédéric Peneau. Named after Peneau’s son and his imaginary pet seal, the restaurant is a spin-off of their Modern French restaurant which first opened in 2013. Soon after opening, Serge et le Phoque in Hong Kong received a Michelin star, plus a mention in the World 50 Best list. Inside, the interior design is awash with Parisian chic. The large dining room is festooned with velvet upholstery, uncovered melamine tables and painted in a warm shade of ‘Millennial’ pink, accentuated by sympathetic lighting. The dining chairs are plush and memorably comfortable, but a little tight around the hips. (A number of prominent male restaurant critics will disapprove, I’m sure). I love the room, but hate the low ceiling and its infernal strip lighting. At lunch, we’re greeted and led to our table by a restaurant manager who goes above and beyond to accommodate, happy to talk through the menu and to answer my (intentionally) difficult questions regarding both the menu and the restaurant’s interiors. Like the original Serge et le Phoque, the a la carte menu here is contemporary French adorned with subtle Asian influences. We begin with a dish of octopus (£16) that’s heavily charred and accompanied by a pool of ají Amarillo chilli sauce – a burst of sunshine both in colour and in taste. Also on the plate, slivers of pickled, palate-cleansing ginger counteract the dish’s overall richness. The slight overcooking of the octopus can be forgiven, though the inclusion of century egg, not mentioned in the menu description “as it puts some people off”, is completely unnecessary. Although less malodorous than its title suggests, the egg’s flavour is completely unsuited to the rest of the dish. Even more baffling is a dish of foie gras (£14), diced and served raw with some carrots, baby turnips, coins of smoked eel and highly-prized Chinese artichokes. A crystal clear chicken broth is then poured onto the prettily-presented dish to ‘cook’ the foie gras. The result is a decent vegetable soup with profound depth of flavour imparted from smoked eel, though the foie gras’ gelatinous texture is less than pleasant. Better is a main of rare lamb noisettes (£26) joined by more smoked eel – thankfully. The lamb’s cooking and seasoning is spot-on, but the aerated mousse of pomme purée screams “style over substance,” unsuited to its convoying puddle of harissa. Of the two mains, grouse pithivier (£28) is far superior. This dome of puff pastry is generously-sized and split down the middle to reveal layers of foie gras, mushroom duxelle and blushing grouse. The pithivier is remarkable, even though it lacks sauce and the accompanying trompette mushrooms taste of little more than cooking oil. On the side, spears of tender stem broccoli (£6) are absolutely delightful, spiked with plenty of miso and a welcome heavy-handed scattering of sesame seeds. To finish, a dome of fluffy rum baba (£8) is drenched with booze and modestly crowned with a quenelle of Chantilly cream, diced mango and fresh passion fruit. Sorrel sorbet (£6), on the other hand, is far removed from the unexciting perfunctory examples available in almost every other restaurant. With profound herbal flavour, not unlike parsley, the sorrel is dressed with grassy olive oil and a whisper of fresh thyme, lending outstanding sweet-savoury balance. Any cooking that pushes boundaries deserves at least some respect, even when it’s more far more disastrous than the less enjoyable dishes at Serge et le Phoque. The space is stunning and the service strikes a perfect balance between professional formality and comfortingly casual. Alas, some of the dishes are fussy and over-embellished – demonstrating tremendous skill, but essentially falling flat. Desserts are great, though. Serge et le Phoque can be found at The Mandrake Hotel, 20-21 Newman Street, London, W1T 1PG. Previous PostIs this the best coffee in the world?